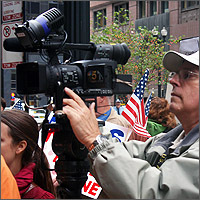 National Press Contact: If you are a reporter covering the Stand Up for Religious Freedom effort nationally, call Tom Ciesielka of TC Public Relations at 312-403-1333 to arrange an interview with Stand Up Rally Co-Director Eric Scheidler or Monica Miller. Press Releases: The Stand Up for Religious Freedom Coalition issued a October 16 press release [PDF], responding to outright falsehoods about the HHS Mandate made by Vice President Joe Biden during his debate with Paul Ryan, and highlighting the over 130 rallies taking place on October 20 to expose the truth about the Mandate. Previously, a September 6 press release [PDF] outlined the goals and purpose of the October 20 Stand Up Rally. Facebook & Twitter: Updates on the October 20 Rally will be posted on the Stand Up Rally Facebook page and under the Twitter hashtag #StandUpRally. Local Contacts: To reach one of the local “Rally Captains” coordinating the individual events nationwide, use this link to send a press inquiry. Stand Up Coalition: The Stand Up Rally is a joint project of the Pro-Life Action League and Citizens for a Pro-Life Society, supported by the Stand Up for Religious Freedom Coalition. Find the complete list of coalition members here.